Automatic sliding door operators are the popular choice for door automation in high use areas. They offer a very reliable method of automatically opening and closing doors, and are available in single sliding and bi-parting versions. Bi-parting is the best choice when space is available. Pedestrians normally approach a door at the centre of the opening. While both types open at the same speed, the bi-parting door will “appear” to open faster as in effect you only wait for the central opening to allow enough room for passage. Single sliding doors must travel a greater distance before the opening is wide enough to pass through. 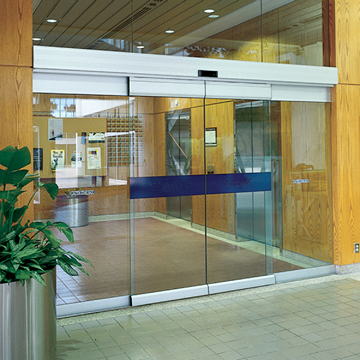 Automatic sliding doors are more reliable than powered swing doors, and require less maintenance. Safety is provided by special presence sensing radar units that also look for anyone stopping within the door area.